PORT-AU-PRINCE, Haiti, November 4, 2010 (ENS) – Emergency supplies and equipment are urgently needed to prepare Haitians for the approaching Tropical Storm Tomas, which could become a hurricane, according to weather forecasters. The storm could affect up to half a million people, particularly in Haiti’s coastal areas, the United Nations said today. 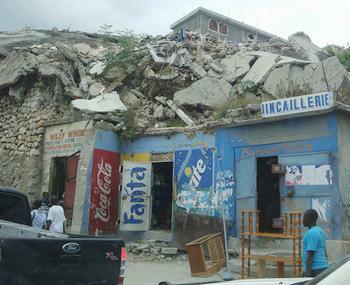 This morning, the center of Tomas was located about 265 miles southwest of the capital of Port au Prince. Tomas is moving toward the north-northwest near six miles per hour. A turn toward the north and northeast with some increase in forward speed is forecast over the next 48 hours. On the forecast track, the center of Tomas will pass near Haiti tonight and early Friday. The U.S. National Weather Service says recent reports from Air Force Reserve and NOAA Hurricane Hunter aircraft indicate maximum sustained winds have increased to near 60 mph (95 kmh) with higher gusts. Tomas could be a hurricane as the center passes between Haiti and Jamaica, and moves north to eastern Cuba and the southeastern Bahamas. The Government of Haiti, humanitarian agencies and the UN stabilization mission in Haiti, MINUSTAH, are scrambling to pre-position emergency supplies and equipment, including trucks, water and sanitation materials, shelter, food and non-food items in the areas most likely to be hit by the storm. “Even with the existing pre-positioned stocks, the potential magnitude of this disaster urgently calls for additional emergency supplies and equipment,” warned Nigel Fisher, the UN Humanitarian Coordinator for Haiti. The approaching storm may be the third humanitarian crisis that Haiti faces this year, coming amid ongoing efforts to assist up to a million people left homeless by the earthquake that devastated the country in January, and a cholera outbreak that erupted last month, killing more than 440 people. Priority needs include reinforced emergency shelter kits for 20,000 families, 80,000 family hygiene kits, 5,000 family water kits, five million sachets of oral rehydration salts, water tankers, water treatment units and field tents to serve as emergency cholera treatment centers, as well as logistics equipment and radios to support ongoing public information about cholera and hurricane alerts, according to the UN Office for the Coordination of Humanitarian Affairs. The possible path of the storm keeps changing, but the latest update suggests a high probability of severe flooding, especially in coastal areas, but also throughout the country. 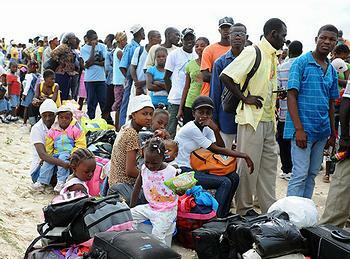 Haitian authorities have been encouraging residents of low-lying coastal areas and camps to seek alternative shelter, where possible, with families and friends settled in safer places. “The poor sanitary conditions in many parts of the country combined with flooding and polluted waters are very likely to accelerate the infection rate,” he warned. A public information campaign is underway to help people prepare, with alerts being sent out to internally displaced persons camps via SMS text messages and radio. All available stocks of tarpaulins and ropes are being used to help people in camps secure their shelters.